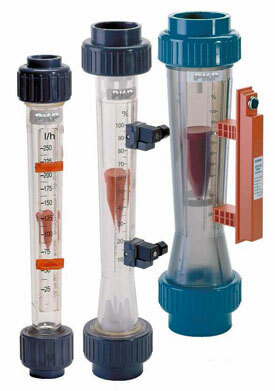 The Model DS15 Plastic Variable Area Flow Meters work according to the proven variable area principle. The float is moved upward in a tapered tube by the flowing medium and its upper edge indicates the flow rate by means of a scale affixed on to the measuring tube. By using a float with an integrated magnet, optional alarm contacts or an analog output transducer may be added. All flow meters have a male thread on the measuring tube and are supplied with two schedule 80 PVC-U pipe couplings. Please call for coupling materials other than PVC.